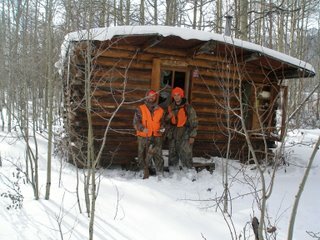 For the first time in ten years I missed opening day of hunting season. Dave and I actually missed the first two days because we were at Lake Powell. I had not been to Powell in a few years so it was good to get down there and do a bit of fishing. It was a great time and very relaxing. So my first hunting day was Monday and we hunted the radio towers. 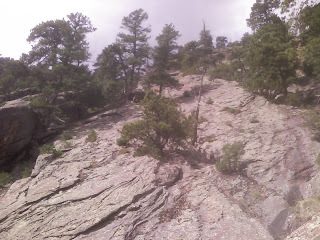 I went to Dalton's rock via the ridge trail, but seen no elk. Tuesday we again hunted the radio towers and I went to second notch. Down in Well's Gulch I saw a cow elk and took a shot. I hiked down in the bottom but found no sign of her. I then hiked all the way around the gulch and back down to camp. 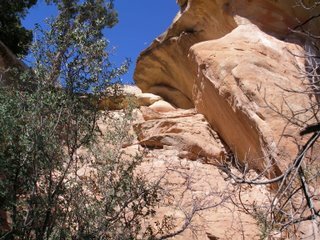 This year we camped in Well's Gulch rather than on Peterson Mesa. That evening we took Steve's jeep up the road to the right that end at the bottom of Alkalai Basin. Dalton shot at a herd of elk crossing a meadow, but missed. We can't keep missing shots! Wednesday we went back and hunted the meadow where Dalton shot. I went across the valley and up the far ridge. Dave hunted up the ridge to the left that defines Well's Gulch. Dalton watched the meadow all morning. I seen quite a few deer up on top in the thick pinions at the end of the Alkalai Basin road. 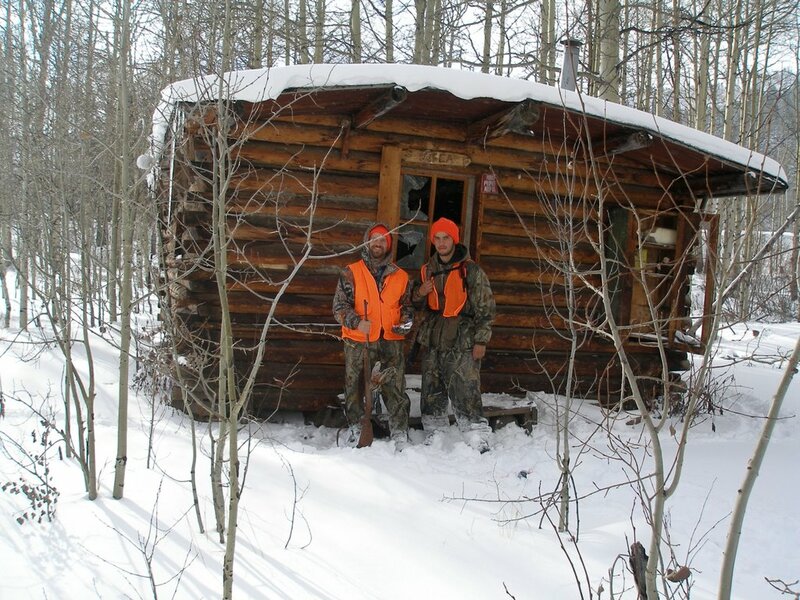 Thursday we got snow which should have helped the hunting a bunch. We took the ATVs up the Delta Airport road. Dalton and I hunted the top of Alkalai Basin, Dave took the bottom. We seen a big buck, but didn't shoot it because we had no tag. In the afternoon we went over to Bull&Brown and met some guys shot a couple of bulls up that trail. We tracked some cows but eventually lost their trail. On the way back my ATV ran out of gas. Dave had to push me all the way from the top down to the airport. Major bummer. Friday we still had snow so we went back and hunted the far ridge at the Radio Towers. I saw mountain lion tracks which was cool, but no elk. No actual elk that is, there was plenty of elk track going every direction. I came very close to the herd according to Dave, who was spying from the main spot on the Radio Towers trail. Dalton again missed shots way low almost to the desert. Saturday Dalton watched from our main spot on the Radio Towers trail. At 11 am Dalton spotted two cows in the lower park, but he missed. I hiked around and down in to see if I could spook them. My feet were really sore hiking back out. Sunday I took the point at our spot, Steve took middle and Dave stayed on ridge. Dave shot a cow. I shot at a bull and missed. Pack out was fairly easy. I definitely need to practice shooting more and in different situations. There are a lot of elk in our area, but you need to make the most of the shots you get! Next year I'm getting my bull. 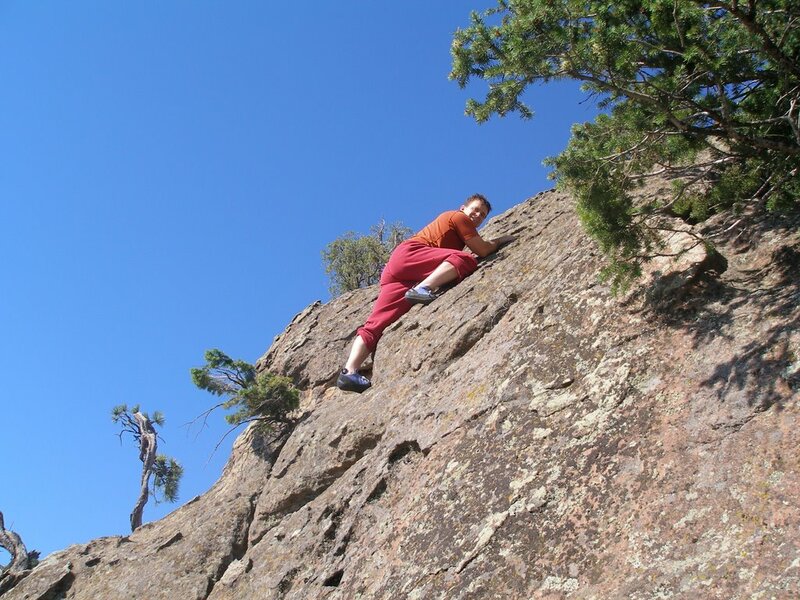 On our second trip to Castlewood Canyon we decided to tackle the 5.8 climb just as you reach the Grocery Store wall. This climb proved to be great fun. The start looks harder than it is. Then the crux is about 15 feet up. I used my knee to help mantle up to the first ledge. The second half requires a bit of a left traverse. There are some nice hand holds that then lead to an under grab to get to the top. 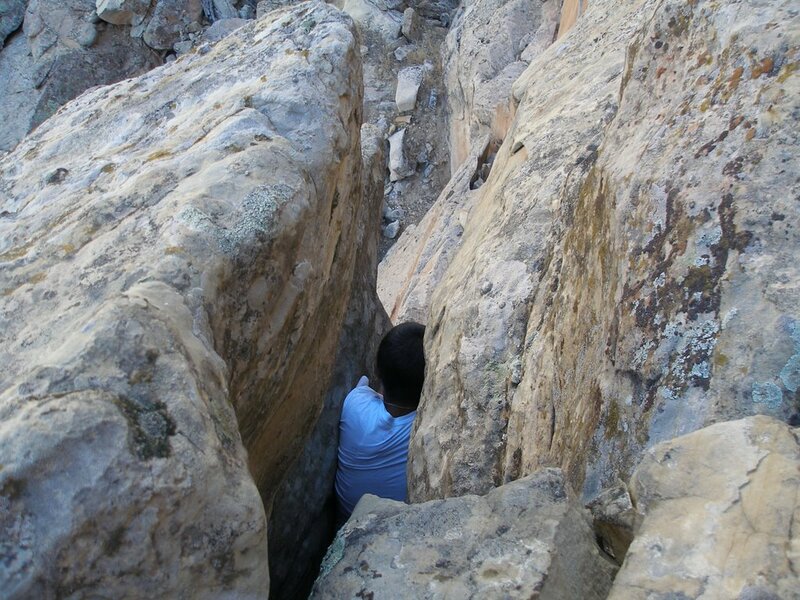 We then climbed a crack that is down the trail to the left. This crack was an easy and not very interesting climb. 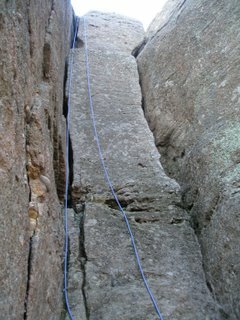 Since we had taken the time to rope it up I climbed both cracks and then tried to straddle climb it. Finally we went around the corner to the right. The rope slid into the crack and after a couple of times trying to rig it we gave up. Some of the eyelets on the top are missing so there isn't a good way to rig the rope. Sean and I decided to do some roped climbing in Castlewood Canyon. 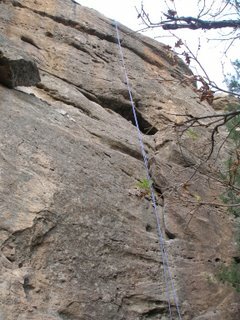 It was my first roped climb outdoors. After years of scrambling and over a year of gym climbing it was about time. We decided to go to the Grocery Store Wall and picked a couple of climbs to warm up with. We had some trouble identifying the climbs, but picked what we thought was one of the easiest climb on the wall. I believe we climbed Peaches and Scream which is rated 5.6. You can check it out over at Mountain Project. It is listed as a trad climb, but you can top rope it. 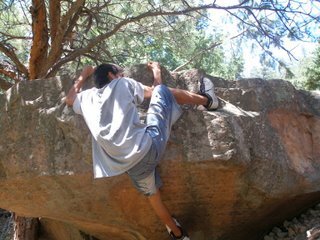 It is fun easy climbing until the crux. 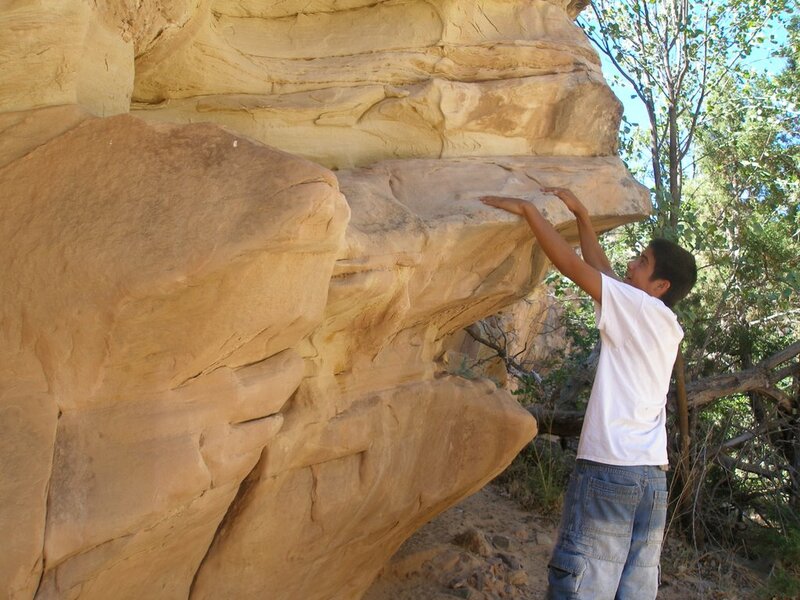 About three quarters of the way up there is a slight overhang of rock that doesn't have an easy holds. It requires a bit of friction and a bit of faith for a couple of fourty-somethings who are not rock gymnasts. 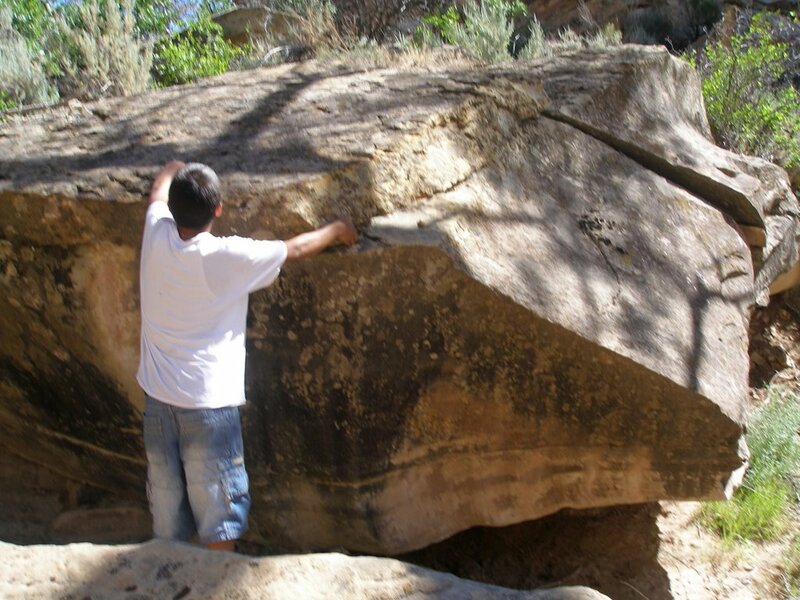 Basically you need to be comfortable with dynamic moves to get past this piece of rock. We then went around the corner and practiced on the far side before the wall breaks up. 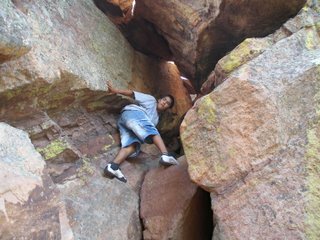 The climbing was more my level here and we had fun. 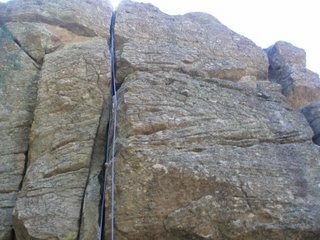 The rock is a bit jagged in places here and I nicked my brand new rope. Check out the picture and tell me if you would climb this rock. I had a great day climbing roped for my first time! Thanks, Sean. 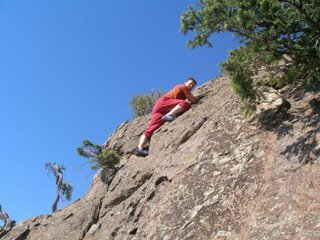 Sean and I decided to scramble the second flatiron of Boulder's famous FlatIrons. Matt and I had done it a couple of times this summer, but it is a fun climb so I was happy to return. 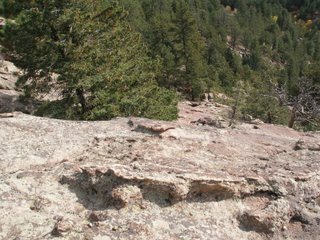 To approach from Chautauqua Park simply follow the guide signs to the 3rd FlatIron. Before you reach the third, you will come to a sharp switchback with a rock face sloping to the sky. It is not marked, but this is the start of the 2nd flatiron. One of the joys of the second is that you never take the same route twice. Sean says that it isn't much different than Third FlatIron climbing. The third just doesn't have an easy escape from the top. I divide the climb into 3 sections. 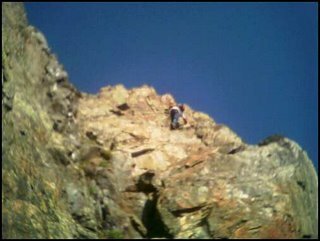 First is interesting scrambling on fairly steep rock. 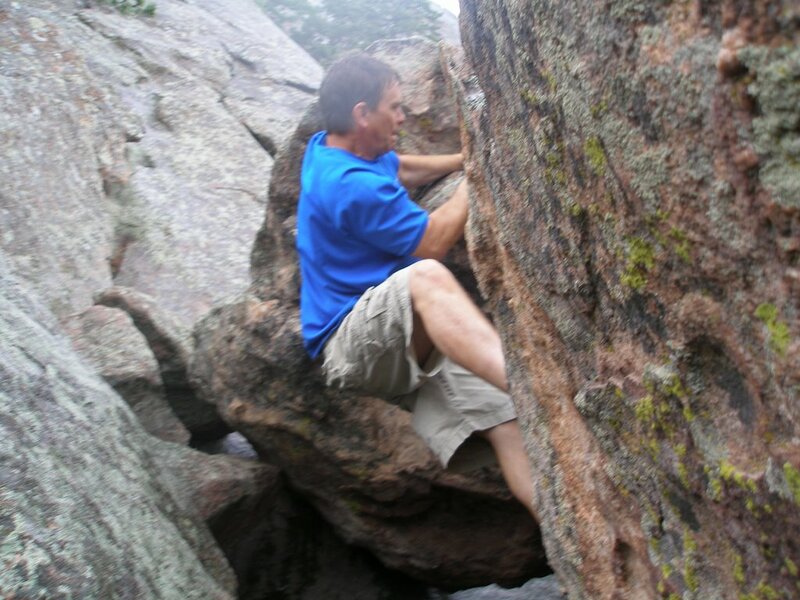 When this rock is wet it can be quite challenging and I would not recommend free climbing. Second is the crux with a tricky move or two. As you get up a couple of hundred feet the hand holds get farther apart and some friction moves might be necessary. Once you are past the hardest section, the climbing angle eases a bit, but you climb yourself to a point. You can take a flying leap from this point over the gap to the other side or you can down climb a bit and escape to the other side that way. From here the Pullman's car soars above you as scramble easily to the top. In September I met up with a new climbing partner named Sean. He was searching online for FlatIrons and found this blog. 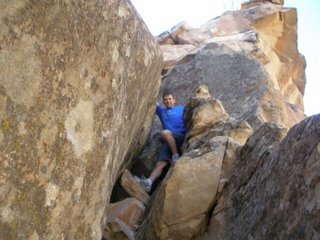 None of his other buddies wanted to do any scrambling so we decided to hook up. On our first outing we decided to try the Keel. The Keel is just to the south of the Shannahan crags. The scrambling here is easy, but the wayis n ot obvious and the rock is broken. 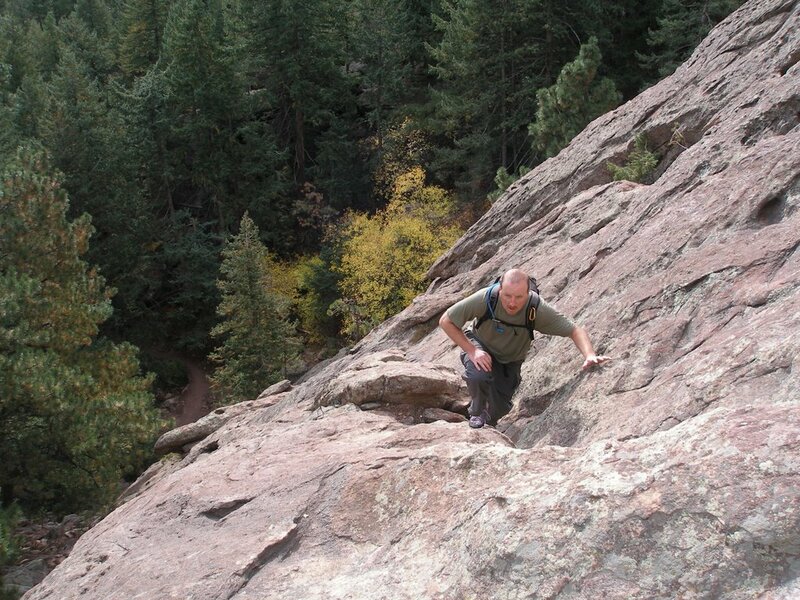 It was fun but not the best scrambling in the FlatIrons. We decided to proceed up to Bear Peak. From where we were it required a bit of bushwhacking. T he peak was quite windy, but the view is great. Sean is a cool guy and knows his stuff when it comes to climbing, so here's to more adventures together. 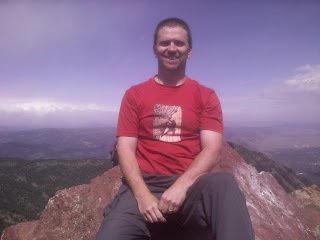 Matt and I took a trip to Summit County to climb Father Dyer Peak. The trailhead is 2.4 miles up Spruce Creek Road. 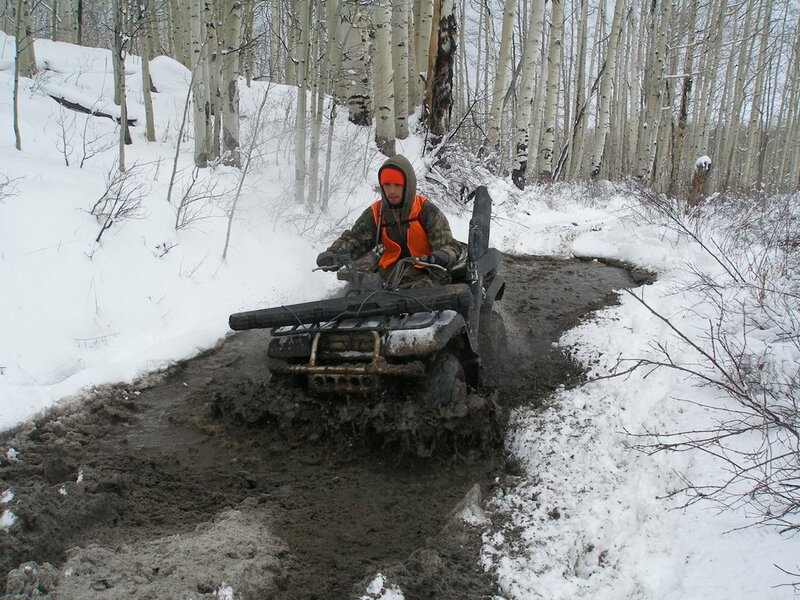 Spruce Creek Road is 4.2 miles south of Breckenridge, Colorado. My camera batteries crapped out, so these photos were taken with my old cell phone. The hike follows the Wheeler trail for about a half mile until you hit the Crystal Lakes 4WD Trail. Hike this road until you get to the cabin and lake. The scramble is now just in front of you. This east ridge offers easy and fun scrambling all the way up. Matt took some of the more challenging climbs to the right of the ridge. This made me a bit nervous, but he had a great time. Check him out in this photo. 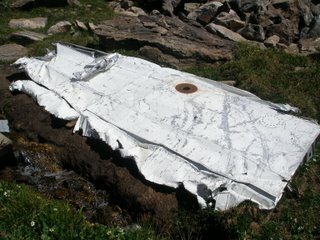 After eating lunch on top, we decided to descend to the left bowl rather than continue on to Crystal Peak (13,852 ft). 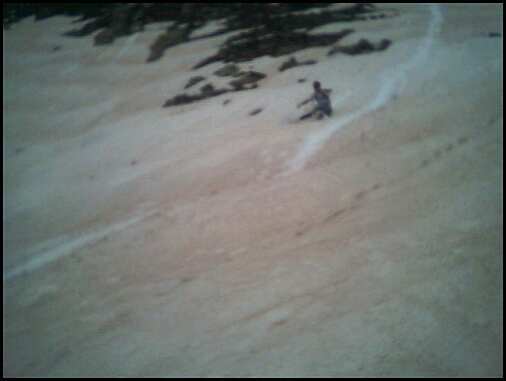 We had much fun glissading down the snowfields in this valley! 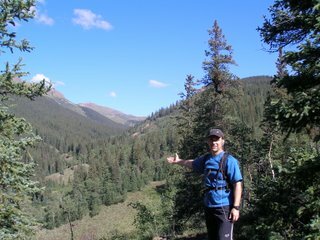 As we traversed back to the trail we decided to climb a coulior back to the ridge. 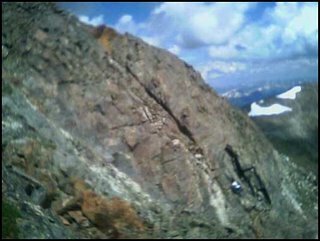 This couloir had some nasty rotten rock that made for interesting scrambling. As we returned to Crystal Lake, I found an arrow head. Quite unusual to see one above treeline. That native american must have been hunting mountain goats. Just as we returned to the truck, the downpour started. There were quite a few people still going up the trail as we descended. I chuckled to myself thinking of them out there soaked in the rain. The scramble is well worth the trip, but just a warning: the traffic is horrendous getting through Breckenridge and back to I-70. It took us over an hour to get back to the highway. Then of course I-70 is always busy on the weekends. Might be better to take 285 back to Denver. I should have gone with my friend Brian to the Mt. Harvard to Mt. Columbia traverse. It is a scramble that I am keen to complete. However I haven't spent enough time at home lately, so I decided to find something closer. I decided to head back to the 4th of July Trailhead like my trip to Mt. Neva. 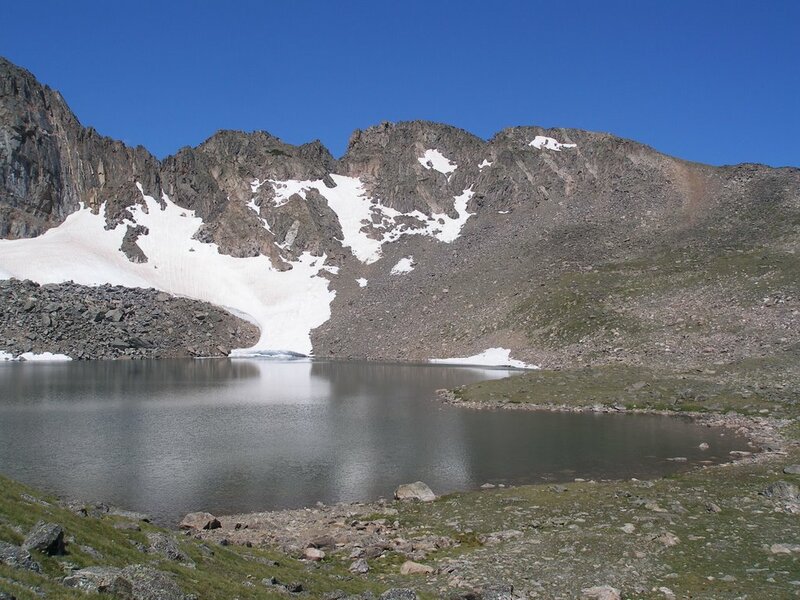 This time I would head up the Arapahoe Glacier trail instead of Araphoe Pass. 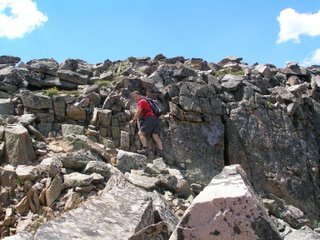 More specifically to do the scramble from North Arapahoe Peak to South Arapahoe Peak. After a couple of switchbacks on this trail, it takes a long eastwardly stretch which had me worried that I would miss the point where I should head straight for North Arapahoe Peak. Stupid me, I left the Scrambles guide book in the damn truck. So I was unsure of my path. I decided to hike across the grassy slope and head straight for the peak. The grassy slope turned out to be not so easy. It was riddled with rocks and ruts unseen from a distance. The final approach to North Arapahoe Peak can be made into a nice scramble if you try. Once at the top, look for the direction dial that points out all the peaks you can see from this lofty point. From here your path is clear, the ridge is quite obvious. 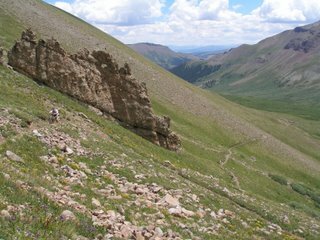 The first part of the ridge is easy hiking, route finding, and scrambling. The fun begins! Slowly as you progress the scrambling gets more focused. The crux of the entire ridge comes fairly soon. Check out this picture (notice the painted arrows.) You have to face climb this short section, but it looks a bit harder than it is. 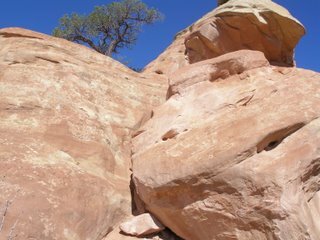 The next crux is a downclimb that can be bypassed via the cairns, but what would be the fun in that? The guide says that some people rappel this section and I can see why, but I wouldn't. It did take me some time to route find my way down. Check it out in the second picture above. The final piece worth mentioning is the start of the ascent of South Arapahoe Peak. Route finding here is aided by cairns, but they are hard to spot at times. The key is to cross the ridge into the next gulley fairly soon as you climb. Then you will come to a fun chock stone shown in this picture. 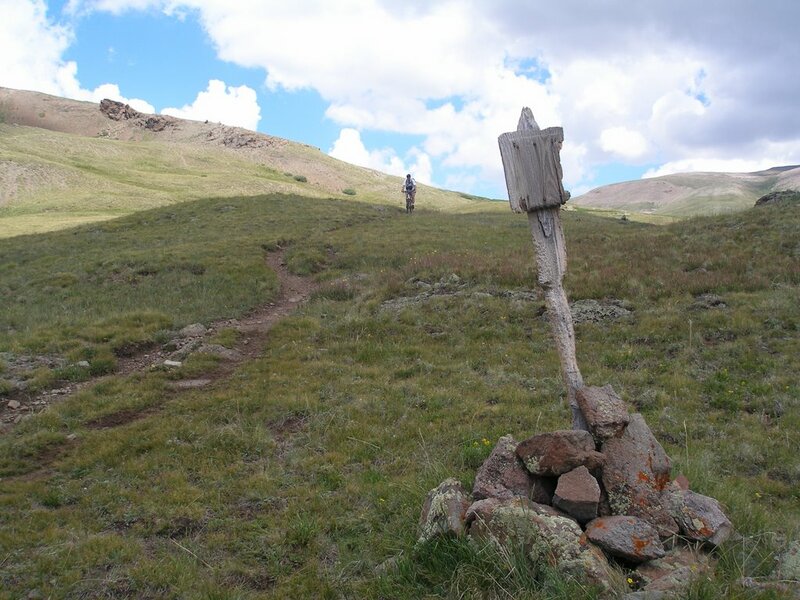 Once around this it is an easy hike to the large cairn at the top of South Arapahoe. I had promised Michelle I would be back home by 1 PM and I was seriously behind schedule at this point. It was about 11 AM. Can you make it back in two hours? No. At least I can't. I tried to pick up my pace on the return trip across the ridge which added an extra element to the fun. As I approached North Arapahoe I was blindly following cairns thinking they were leading me around the peak. I lost the trail at some point because I soon found myself back in Class 3 territory descending the south face. There are many cliffs thru here so I tried to continue traversing east. It added some adventure to the end of the day for sure. There is a lot of loose rock here because nobody goes this way. I finally made it to the steep grassy slopes and a quick descent to the trail. This scramble is very fun and highly recommended. Check out this picture of the entire ridge. It is not as intense as Mt. Neva, but still offers some fair exposure. 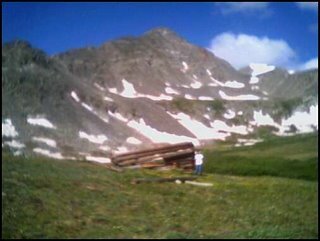 Next up is a trip to Sections 24 and 25 on the Colorado Trail. Ah, finally. 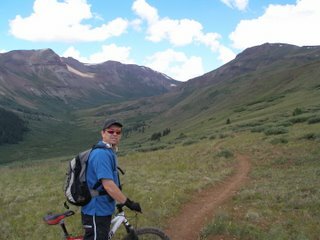 Nick and I resumed our quest to complete the Colorado Trail with a trip to section 23 in the San Juan Mountains. 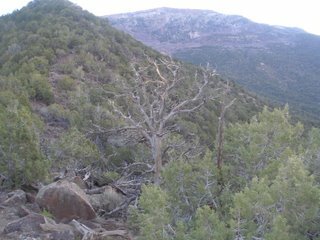 We decided to make a big loop up Lost Trail Creek, across section 23, then back down the dirt road to the Lost Trail Campground and the Rio Grande Reservoir. I was imagining the ascent up the Lost Trail would find us pushing our bikes most of the way, but it turned out to be a nice ATV trail. There was lots of uphill for sure, but also gentle rolling in valley. The last push to the pass was the toughest. On the way I seen a nice four point buck. When we got to the pass, we found no trace of the camp we had to abandon last October. Check out our epic here. Finally on the Colorado Trail, we enjoyed a nice bike ride down into the most isolated section on the entire C.T. If you don't mind a climb, I would recommend not taking the bike detour mentioned in the official guide. The pass is guarded by an army of goblins. These crags are just begging to be climbed, so I decided to give one a scramble. The rock is a bit rotten so route finding is a slow go. 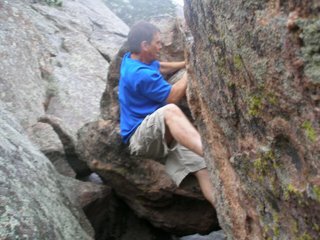 Check out the arch crag I climbed. After pushing our bikes the better part of three miles, we finally made it to the pass and our reward: the descent. It doesn't get better than this. A very fun downhill ride into a beautiful valley. I did wreck on a steep stretch covered in baby heads. When I landed I bent my first two fingers backwards, swelling my hand and making it hard to brake. There are several stream crossings on this descent. I tried to cross every stream, but wrecked twice on the deeper crossings. Although secluded we did encounter many fishermen, a couple of motorcyclists, and plenty of hikers. 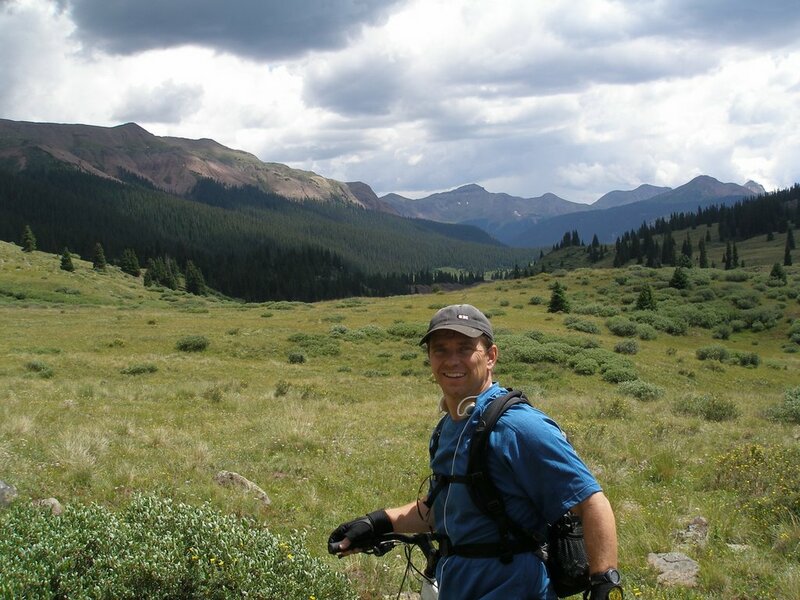 At the end of CT 23 we realized it was 10 miles back to rio grande reservoir and our camp. Nick had seriously under estimated the length of this section (Nick has this tendency. It's the reason Dalton doesn't go with us anymore!) The road starts out with a long uphill slog for first couple of miles, but then its mostly downhill and fun ride on a wide dirt road. Flying down the hill, I came upon a nicely banked corner. I thought I would whip around it, but fell again on the damn gravel. I lost a little hide on this one. All together it was a thirty mile trek, but we weren't overly tired at the end. I must say this was a great day and a truly spectacular ride. Five sections to go! 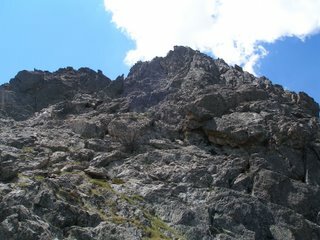 On Sunday I took a trip to the Indian Peaks Wilderness for a scramble up the north ridge to Mount Neva. Starting from the Buckingham Campground (also called the Fourth of July Trailhead) its a hike all the way up to Arapahoe Pass. However, I mistakenly took the diamond lake trail and it turned out to be a great move. Although the going got swampy after leaving the trail and heading for the ridge, I soon came upon a cabin and an old mine. The bushwacking was Class 2+ allowing as much rock scrambling as you want to add. I hit an impass at a fast moving creek that was at least 3 feet wide. After contemplating a wade, I decided to jump the creek since the water was moving fast. Bad move. I tweaked my back but good on the landing. In hind sight I should have removed my backpack before the hop. In the cliff bands just below Lake Dorothy I happened upon a plane crash. Check out the picture... it looks to be a Cessna from the flaps. The scramble is fun up to Lake Dorothy and a good warm up for the ridge to come. 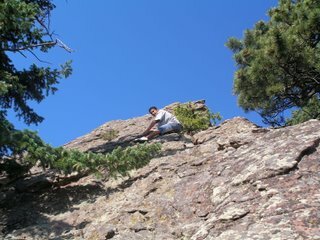 Finally on North Ridge, the first scramble continues your preparation for the Class 4 scramble above. The scramble on the North Ridge looks most daunting from the lake (see picture), but gets less intimidating the closer you get. 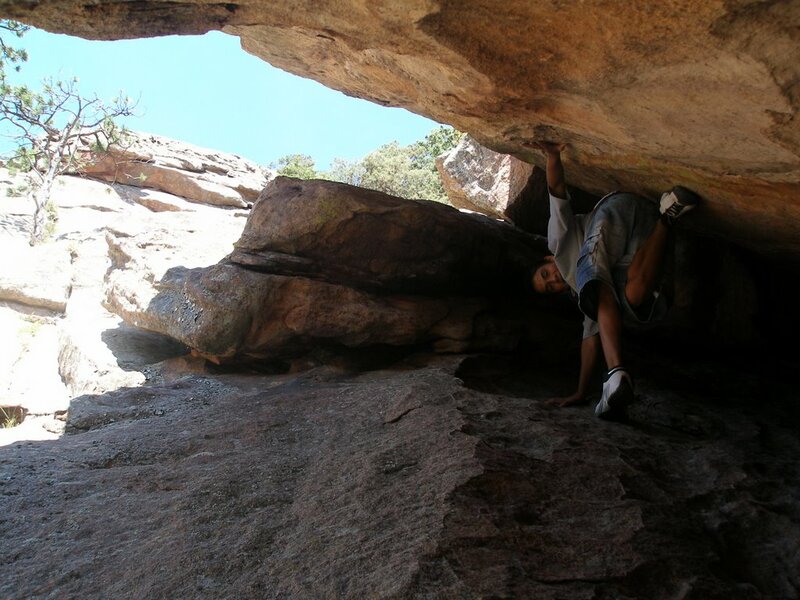 Once on the crux it is pure fun. 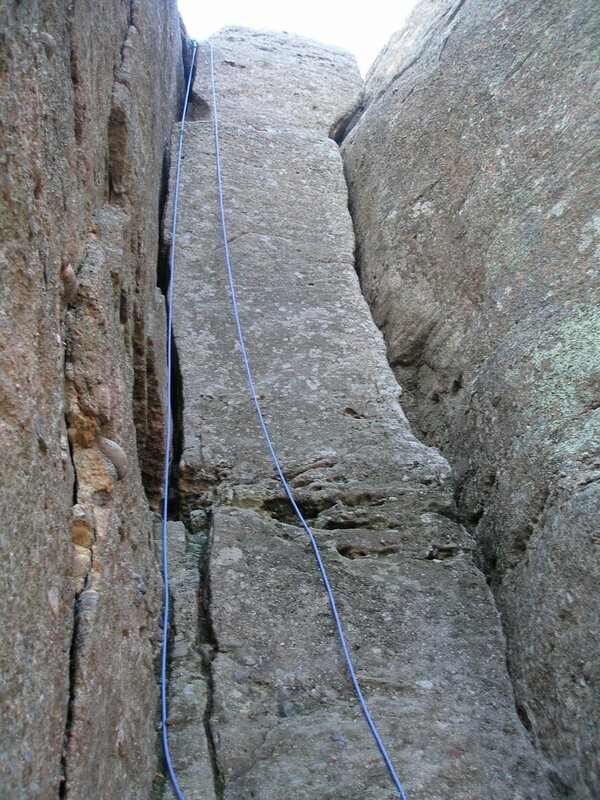 The downclimb immediately following the crux forces you to the left. I ran out of camera battery on top of Mt. Neva so no photos at the summit. 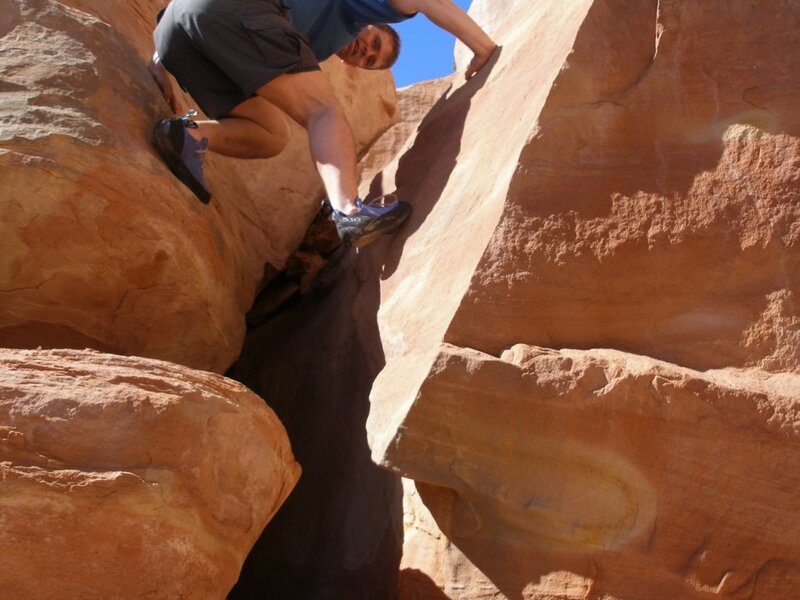 I followed Dave Cooper's advice from his book Colorado Scramblesand found a descent that split two lakes below. This downclimb is a fun scramble over a vast boulder field. 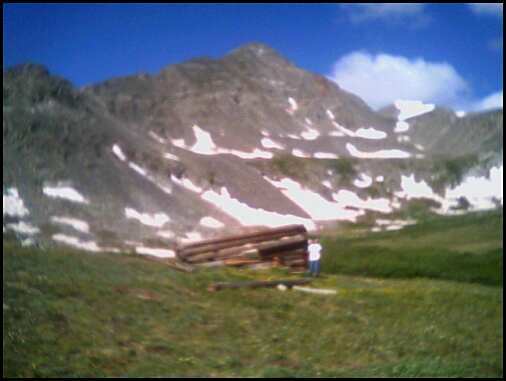 The boulder field and snow fields continue on long trek back to Arapahoe Pass trail. 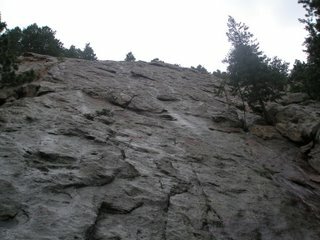 I stayed high which led me to one more challenging downclimb over wet rock caused by melting snow. 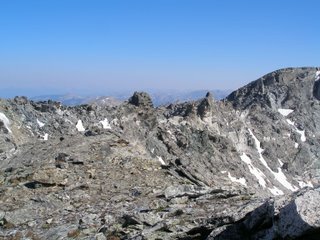 All in all this scramble tops both the Kelso Ridge on Torres and Father Dyer Peak. 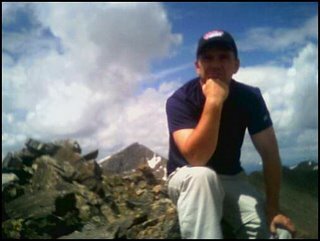 For me it ranks just below the scramble on the Crestone Peak for challenge and fun. Yesterday Matt and I took a trip to the second flatiron. As our confidence grows, we have started scrambling on a few Class 4 rocks. We approached this flatiron from Chautauqua Park and like last time took the wrong trail initially. We took the West Side trail which cuts off most of the scramble. We still managed to get in a couple hundred yards of climbing in a steady drizzle. By staying on the north west ridge you can escape to the north in many spots. It is a fun scramble and with fewer holds than El Camino Royale, it makes route finding a good mental drill. After a second go at this ridge, Matt and I decided to find the true nadir of the face as Richard Rossiter describes in Rock Climbing the Flatirons. I didn't know the definition of nadir: the lowest point of anything. Well we found the nadir, but by then the drizzle had turned into full blown rain. 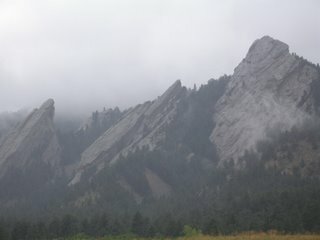 Even the flatirons turn into slickrock in the rain. The other definition of nadir seemed appropriate in this case: an extreme state of adversity. We decided to give it a try anyway, and started climbing. There were a couple of tricky spots and Matt's tennis shoes did not grip as well as my 5.10's. We made it up about half way on the climb called Freeway. 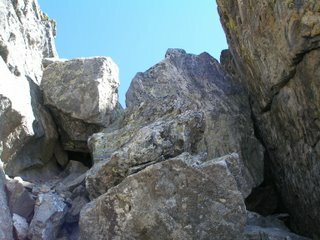 There are no easy escape routes here, but Matt and I downclimbed a small gulley which ended in a nasty crack climb. Muddy and wet, we inched our way down to safer climbing. Quite fun. 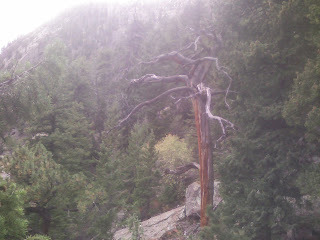 With the rain steady on, we decided to not push our luck further and instead just hike on up to the Royal Arch. Matt climbed his west side under chimney again. Our climbing on the second was to the right and below the large block called the pullman car in this photo. The El Camino Royale climb is a scramble up the Regency Flatiron. 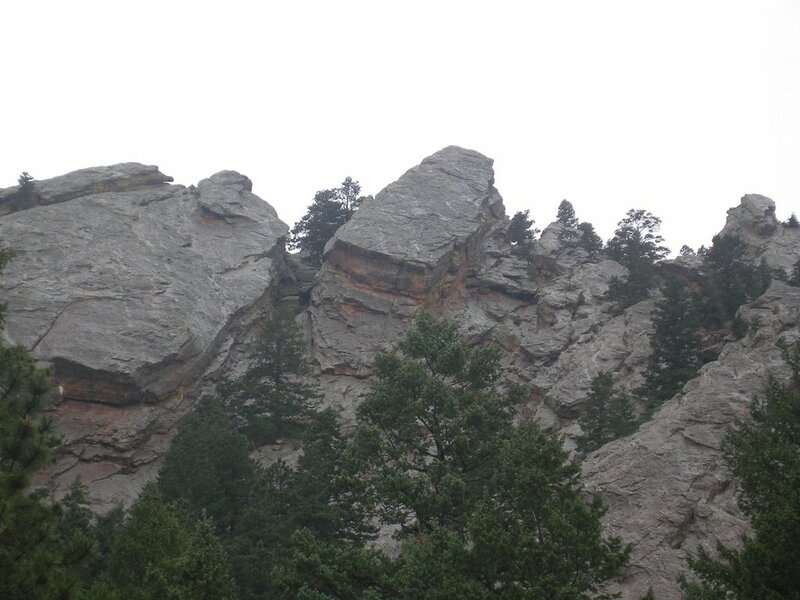 This rock is located just below (east of) the Royal Arch in Boulder's Flatirons. Matt and I approached this flatiron from the Chautauqua Park trailhead, but a shorter approach would be from the NCAR trailhead as described in Gerry Roach's Flatiron classics. From NCAR take the Mesa Trail north until you see a trail that heads for the Regency. 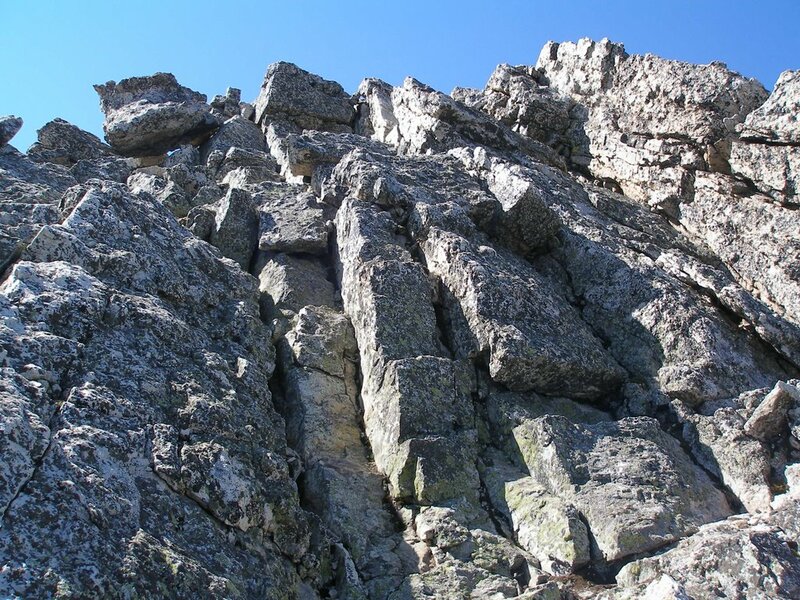 This scramble is rated class 3, the holds are plentiful and the climbing is superb. 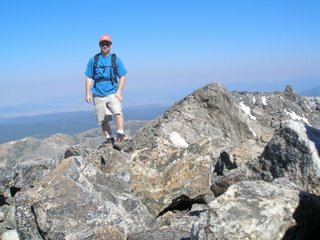 We stayed on the northeast ridge on our first ascent as recommended by Gerry and there was never a time when I felt nervous. Matt is much faster going up than I am so he led the way. In contrast, I am a bit faster descending than Matt is. Because we took the long way there, we didn't have a lot of time, because we wanted to spend some of Indepence Day with Michelle. So rather than a full second ascent Matt decided to see how far he could go in ten minutes. He made it an impressive 300 yards! But it made him very tired. 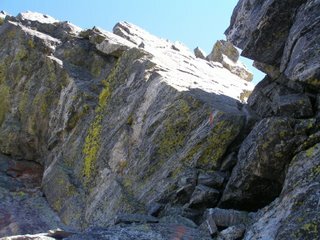 I climbed a bit on the south east face. We met and descended a fun chimney as you can see in the picture. Matt wanted to check out Royal Arch so we hiked up to the south of the Regency. We probably could have scrambled the royal road again and downclimbed to the west after seeing it from below. 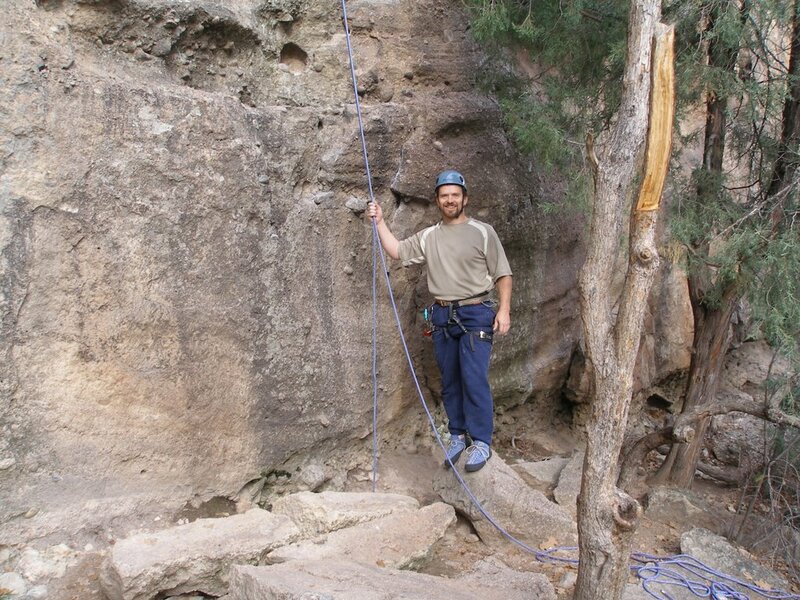 Matt climbed the class 3 east side of the Royal Arch and also climbed the chimney underneath the west side. Another weekend in Grand Junction and another scramble up Little Park Road. This time Matt, Gracie and I went to Rough Canyon. The trail descends a gnarly old 4x4 trail and splits. Going left leads to rough canyon or right leads to the micah mines. We hiked for a bit and found some nice boulders to try. 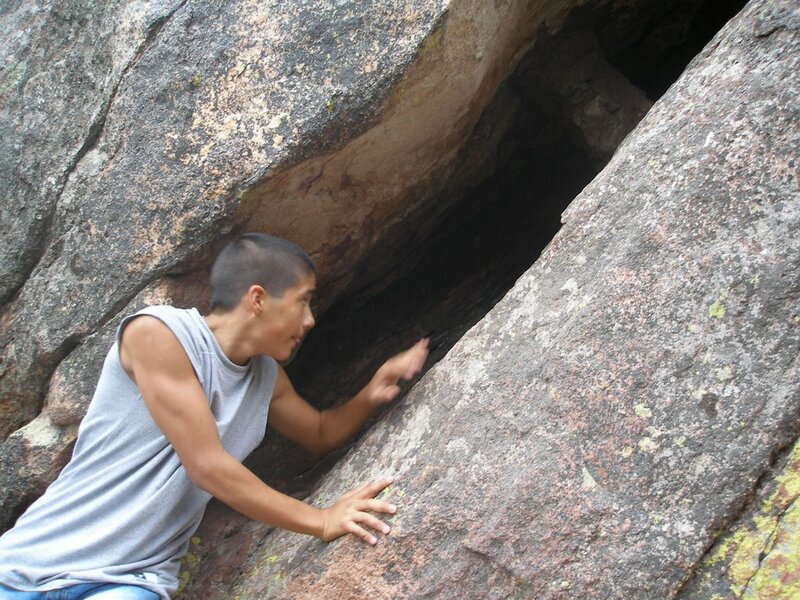 Matt showed me how to get up the boulder in this picture. 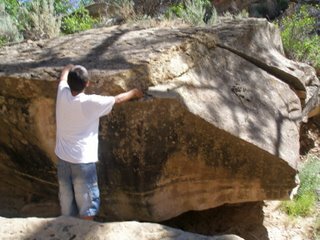 He had to transfer his hands a couple of times in the crack, smear quite a bit, and finally use his knees to conquer it. The funnest place we found was a chimney climb. Chimneys are great because they give you that false sense of security that you can always use your muscles to avoid falls. As we climbed, of course some hikers had to happen by which added a nother worry to my mind: Gracie. She was a good dog and didn't bother them. As we were descending the chimney, Matt stepped on a chock-stone and it gave way. It fell, but luckily Matt didn't. The descent seemed to worry Matt more than the ascent. For me it was the reverse. 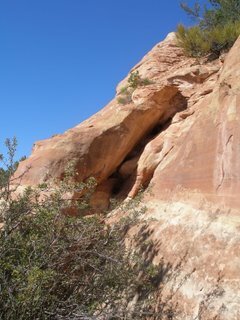 The final fun spot was a small overhang that we found. Matt tried to climb it for awhile and couldn't quite get it. Then the old man had to show him how it's done. The key was foot placement, smearing, and good old fashion muscle. It made us even after he schooled me on that boulder. Michelle needed to go to Grand Junction to care for her mom and grandma, so the past two weekends I have been travelling from here to there. This hasn't stopped Matt and I from scrambling though. I didn't have a guide book on good climbs in Grand Jct., so I just had to use my instincts and head for the crags up Little Park Road. They sure have done a lot of improvements since I was a kid growing up here. The first spot I tried was the Ribbon Trail. This trail leads out onto some very large slick rock that would be fun to mountain bike on. Instead of following the trail, head west toward the cliffs probably 1,000 yards from the parking lot. All along this canyon are places to scramble. 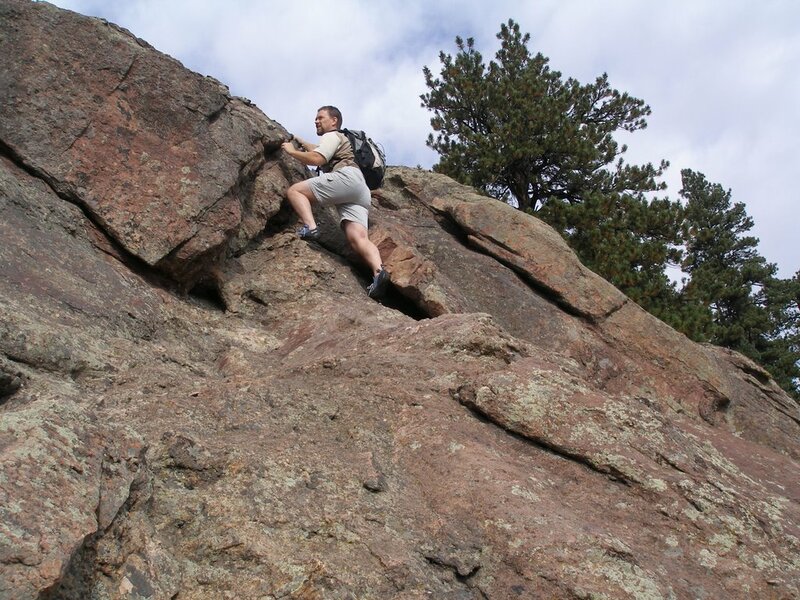 The rock is much softer than the Flatirons. Check out the pictures. Does anyone know the names of these climbs?